Well done to Andy, Ian & Keith!!!! See more TOMs Ladder details by clicking HERE. 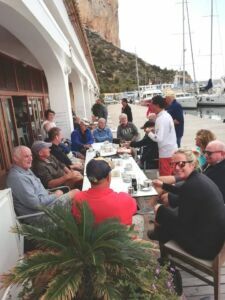 This is the 6th year that Jim has arranged his “Bash” with Real Club Náutico Calpe, inviting CBYA members, and RCNC club members, to join his UK sailing friends, for two days’ of racing on the TOMs. Race courses for both days were different to the norm, and were made slightly more technical by using gates. Eleven (11) intrepid TOMs Ladder sailors sallied forth on Thursday 14 February – Valentines’ Day – to do battle on the waves. The sea state was fine, and we had plenty of wind, albeit a bit flukey. We sailed four races in quick succession, and then retired to Dracula’s Restaurant for some interesting discussions on the subject of yacht racing rules and protests. Let’s hear it for our TOMs Organisers! The image above shows Nikki Dwyer, our current TOMs Organiser. She took over from David Crabb in October 2018 and has quickly got to grips with the job. Many thanks to David for volunteering for the role and performing it so well! Another great CBYA TOMs Ladder Event! Another fun TOMs Ladder event took place on Thursday 8th November. 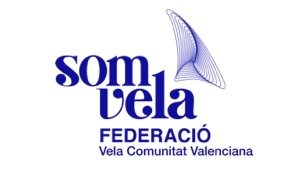 Eighteen CBYA members participated – sailing five TOMs. This event is designed to encourage those requiring more TOMs race experience. We race with white sails only – no spinnakers – so the sailing is not too demanding. We now generally schedule TOMs Ladder events on Thursdays. Points are accumulated based on race results over a 6 – 8 week period, and prizes are awarded to those with the lowest total points count at the end of each series. This second 2018 TOMs Ladder is scheduled to run until the end of November. 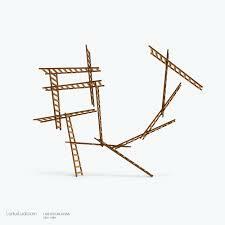 The TOMs Ladder has been well supported since its introduction earlier this year. 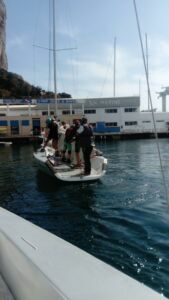 As normal, the organiser, Chris de Boer, drew the names of the five RCNC-approved TOMs skippers from those available on the day, and also drew the crews for each boat. Surprisingly the crew selections were reasonably balanced, even though two of the boats had four crew, as opposed to three crew only on the others, possibly allowing a slight overall weight advantage to the lighter boats. Roger Buckle kindly agreed to bring out the RCNC inflatable, lay the course, and act as Race Officer. The wind was light, so we enjoyed reasonably challenging race conditions. One TOM had some difficulty getting back into the marina. We enjoyed a spot of TOM fishing on our return after the racing, and then retired to the RCNC bar. 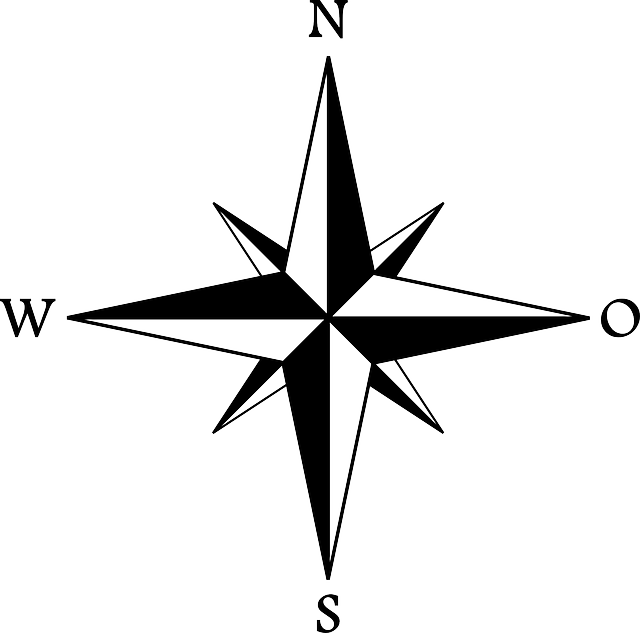 Note that we also run regular sail training days for those new to TOM sailing. These are currently on Saturdays, but will also be scheduled for Thursdays after the current TOMs Ladder has ended. Why not come along and join us for future TOMs Ladder and/or TOM sail training events? Click HERE for the final Autumn series results. Many thanks to Chris for running another great TOMs Ladder event. In order to encourage more raft-up participation the CBYA organises TOMs longer-distance cruises and raft-ups each year. 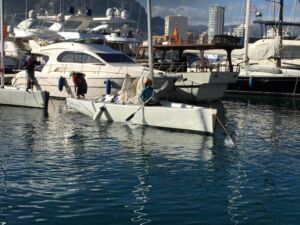 The plan being to rent all six TOMs, and to sail them to either Moraira, or Albir, for a raft-up, swim and a picnic tea/late lunch. Safety cover being provided by one (or more) powerboat(s). These cruises generally take 1 – 2 hours each way. 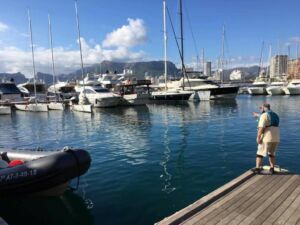 We also encourage other CBYA member-owned yachts and motor boats to come along and join the fun. Bacalao wins the 2018 CBYA Challenge Trophy! 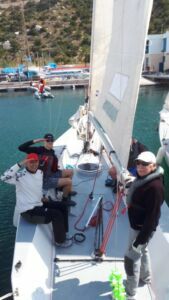 The 2018 CBYA-RCNC Challenge took place at Real Club Náutico de Calpe (RCNC) on Sunday 14th October. 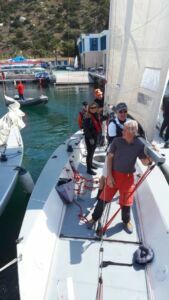 This is the only team racing event in the CBYA calendar and involves two teams, “Lubina” and “Bacalao“, competing for the honour of being awarded the CBYA Challenge Trophy on TOM 28 yachts. The teams are made up of crews of four sailors – two from the CBYA, and two from RCNC, on each boat. TOMS Ladder Competition Rides Again! The Autumn TOMs Ladder competition has started – with two series planned; one in October and one in November. 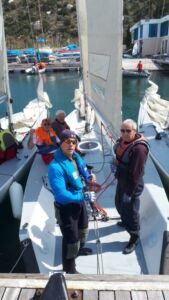 The first event was held on 4th October with 16 people attending; some were experienced skipper/racers, and some novices to make up the mix of crews for the five TOMs.